The compilation consists of four works from the era 2000-2006, often sharing the very same tracks, though more than once coming in a new, re-recorded version. The feast opens with a recently re-recorded version of Chaos Reborn, a sixteen-tracker (here also including six ‘karaoke’ versions???) that was initially released (in 2004) as part of a split with FightBack. 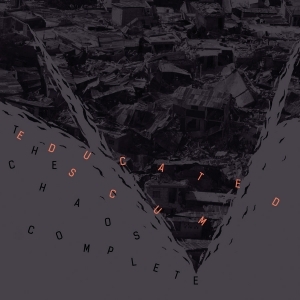 Also the demonstrational recording From Chaos To Disorder is part of this compilation, but interesting for the fans must be the addition of Chaos Rehearsed, consisting of six pieces that were recorded live in the studio in 2006, as well as the remastered version of the rare 2000-demo, here sweetly called The Origin Of Chaos. Anyway, from sonic side, Educated Scum play a rather primal, Crust / Punk-injected form of Grindeath (Grindcore-meet-Death Metal, or something like that), mainly based on simplistic structures and performed through nihilistic riffs and primitive rhythm basics. Indeed, this sounds like the initial essence. Throughout most pieces, which are very short in general (this compilation has more tracks than minutes! ), one can notice the basics of the scene: growling grunts, groovy bass lines, minimalistic guitar riffs, harsh drum patterns and a total lack of progressive experiment. Yet, from time to time, you might meet some cool surprises: majestic leads and solos (like the Psalm To Life-diptych), somewhat crazy samples and Napalm Death / Brutal Truth-injected old school grandeur.